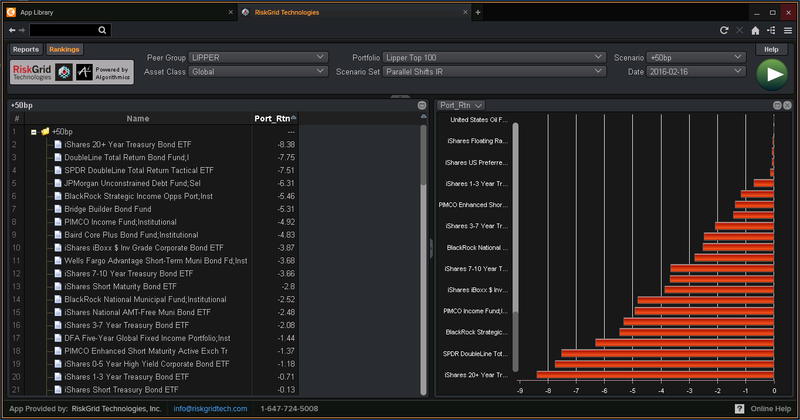 View risk analytics and compare risk rankings on top Lipper peer-groups based on quarterly net fund inflows, annual compounded returns and ETF trading volumes. You can analyze forward-looking risk analytics such as Value-at-Risk and Stress Tests on all major risk factors including interest rates, equity indices and foreign exchange rates and compare these risk measures to a benchmark. You can also compare risk rankings on funds based on these forward-looking risk analytics. Risk rankings based on VaR or Stress Scenarios including FED stress scenarios can be viewed in a table or graph. RiskGrid is powered by industry leading analytics from Algorithmics which use forward-looking valuation models on the underlying holdings of the funds and benchmarks to compute risk analytics.